Japan/Poland, 2001, 107 minutes, Colour. This is a Japanese film, directed by , but filmed in Poland with a Polish cast. Avalon is the mythical island in the Arthurian legends where the souls of the dead finally go. Here it is the name of a computer game, played by disaffected youth, even to death. It could be described as how The Matrix might have been made if it had been directed Kieslof Kieslowski. It is Play Station meets Heidegger with a touch of Nietzsche. 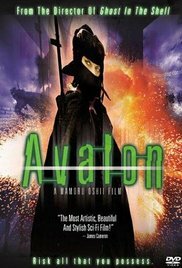 There is also an oratorio entitled Avalon which introduces the climax of the film. Instead of Neo, we now have a heroic woman, Ash, who used to work with a team but is now an individualistic warrior. The world she lives in could be called Kafkaesque. The director wanted the context to be that of a communist city with echoes of totalitarianism and its dead hand. However, she tends to retreat into a sepia and white virtual world of guns, tanks and explosions where characters become two dimensional and break into pieces as they die. As Ash goes further up the hierarchy of Avalon warriors, she emerges into a perfectly normal street scene and attends the oratorio. She has to confront a spectre which may lead her to complete victory... or to Avalon. The media kit for Avalon has pages full of detail about the technical wizardry used in the creation of the film. It has rather less on the philosophical dimensions which may be less spectacular but are crucial nonetheless. Actually, it has far more to say about identity, control and the value of human life than The Matrix.